People gathered around the Pride Flag in Hillcrest, a historically LGBT community in San Diego on June 12. 2016. 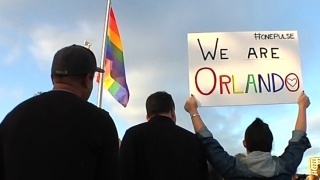 A gunman wielding an assault-type rifle and a handgun opened fire inside a crowded gay nightclub in Orlando, Florida, early Sunday, killing at least 49 people in the deadliest mass shooting in modern U.S. history.